Atleti were defeated on Saturday in the Madrid Derby. The final result was 3-1 in a game in which Morata had a goal disallowed. We started the match with very high intensity, pushed by a roaring Wanda Metropolitano, which led us to a few chances early on. The best one came from Thomas, who broke into the box and shot, but the ball went wide. Unfortunately, Madrid took the lead after 15 minutes following a corner. The ball arrived to Casemiro and the Brazilian scored. But our team had no intention to back down, and we found the equaliser ten minutes later through Griezmann. The Frenchman made a run, received the pass, and put the ball between Courtois’ legs. The Wanda Metropolitano erupted. We were playing very well, yet luck was not on our side. Just before half-time, Giménez tripped Vinicius on the edge of the box, and the referee pointed to the penalty spot. Ramos converted and the first half ended with our team 2-1 down. Inside the first ten minutes of the second half, we had a goal disallowed. Morata received the goal and chipped it over the keeper. It was a great goal, but after checking VAR, the referees decided to disallow it. 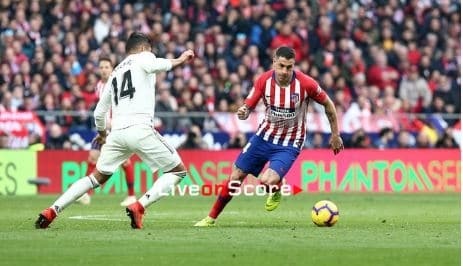 Simeone moved things around and made all three changes inside the first 25 minutes of the second half. Vitolo, Rodrigo and Kalinic came on for Lemar, Correa and Morata. Unfortunately, today was not our day and Real Madrid got the third in the 75th minute. This time Bale was the goalscorer. Thomas Partey was sent off and the game ended 3-1.